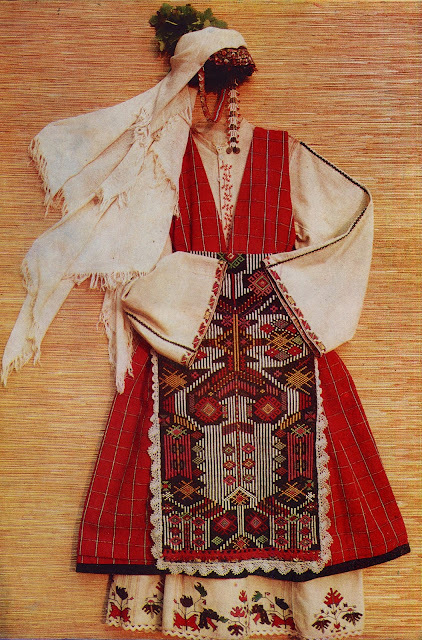 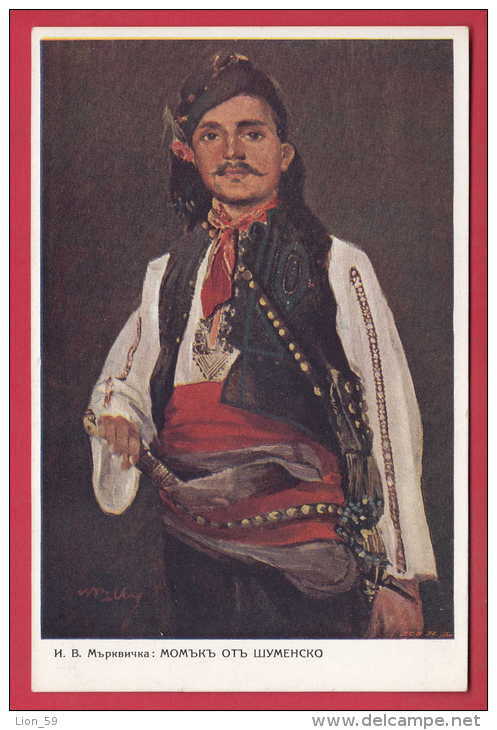 Bulgaria is known for the richness of its folklore. 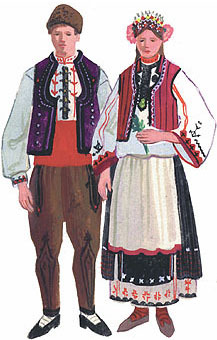 The image above is from the rose festival. 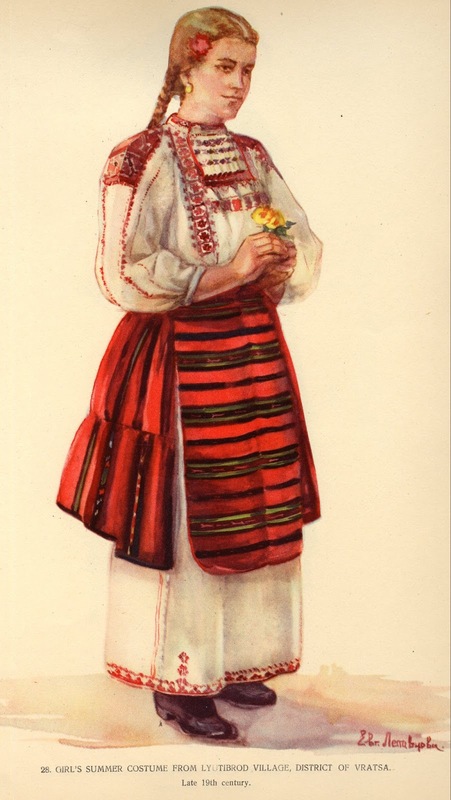 Roses have been grown in the central valley of Bulgaria since at least Roman times. 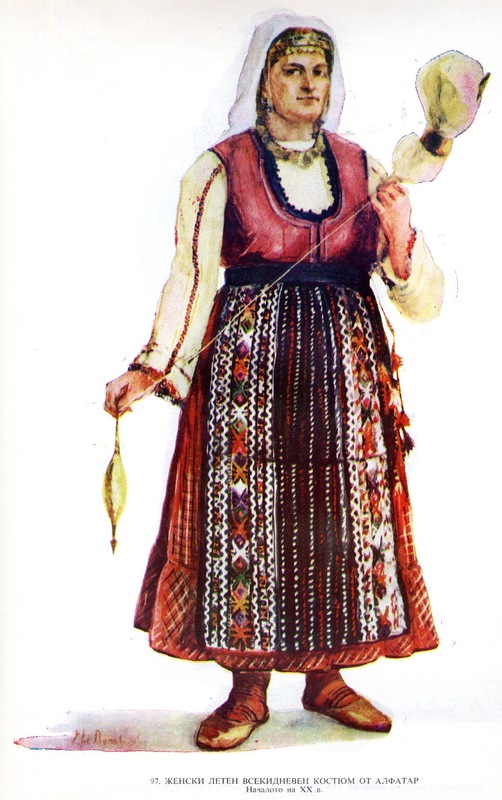 These girls are wearing mass produced stage costumes, but are still looking good. 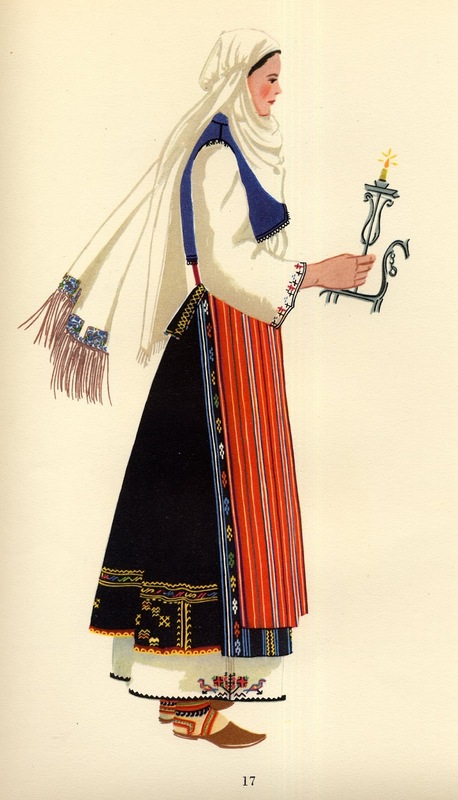 This costume is from the north. 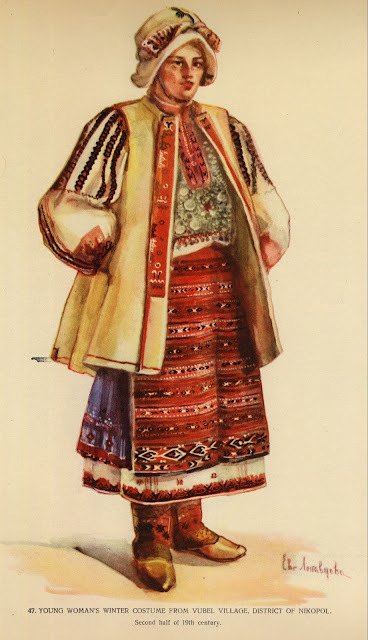 Bulgaria is currently divided into oblasts [formerly okrugs], but like so many other countries, these are strictly administrative divisions and do not reflect traditional or cultural regions. 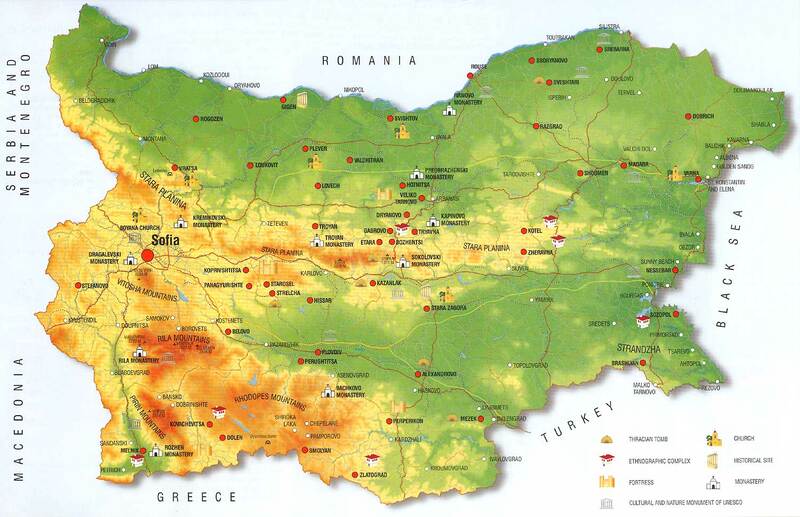 Here is a physical map of Bulgaria followed by one of the cultural regions of Bulgaria. 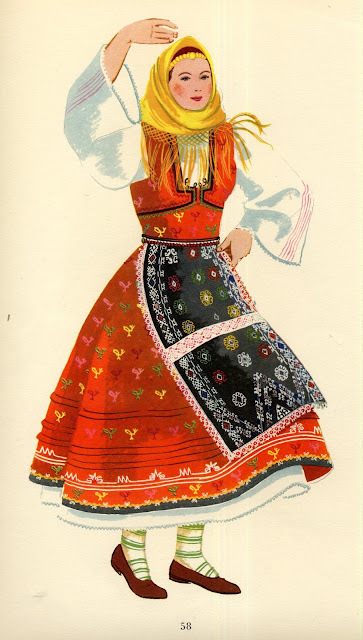 You can see that the cultural regions correspond to physical features of the country. 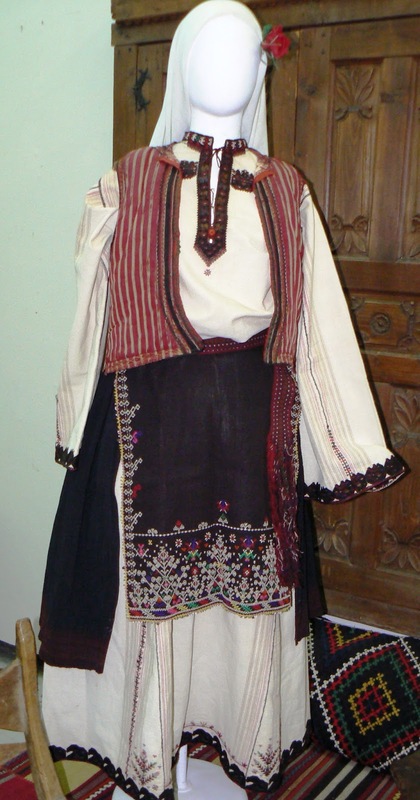 The oblasts are not based on the cultural regions, but I will use them as a method of presenting costumes from all over the country. 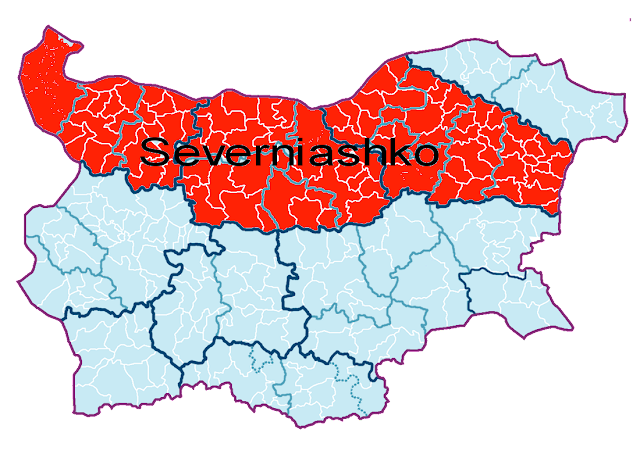 The exact borders of the regions are not very clear in many cases, as they often follow physical boundaries. 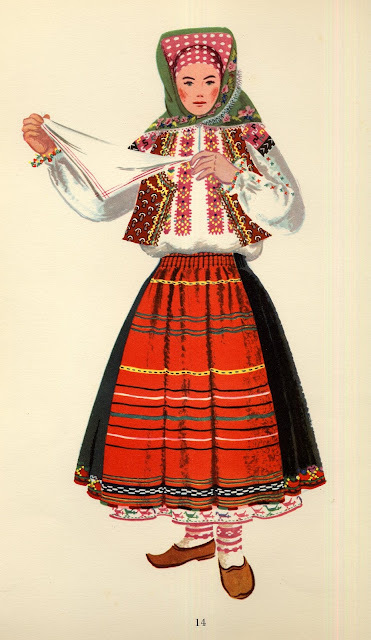 This just means 'the north'. This is the region between the Danube river on the north and the Balkan mountains in the south. In the east the border is not clear, intergrading with Dobrudja in the northeast and Thrace in the southeast, as the mountains peter out before reaching the Black Sea. 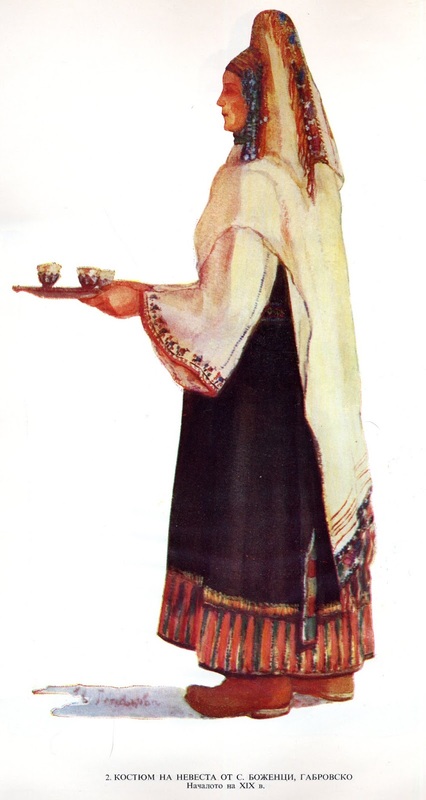 This is one interpretation of its extent. 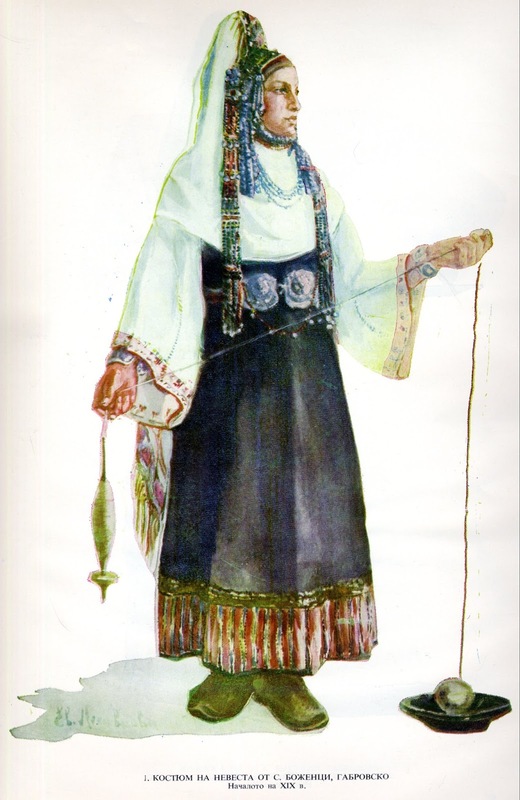 This region is characterized by the double apron costume for the women, [one apron in front, and the other in back], and belodreshta for the men, which means that the outer clothing is made from natural white wool rather than black. 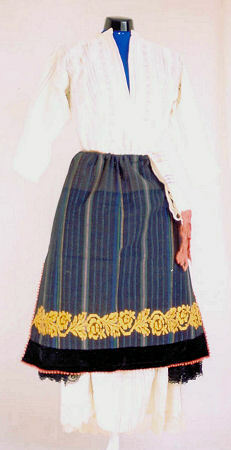 The two aprons vary in width and length. 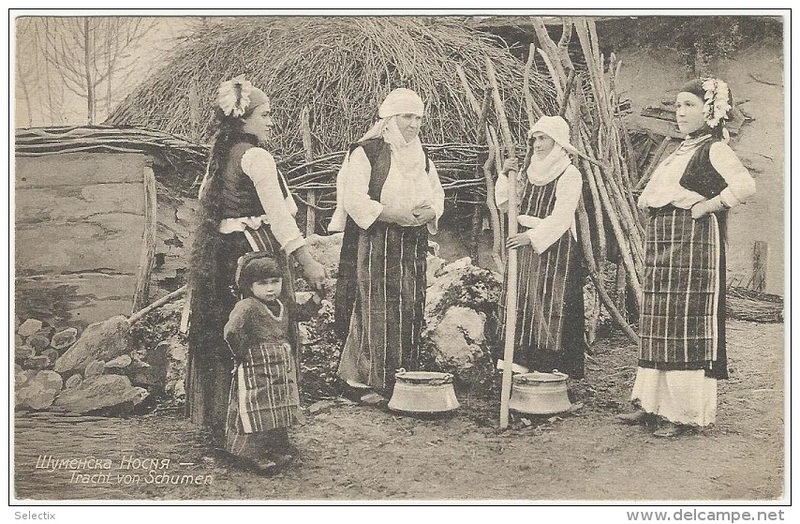 Izvor village. 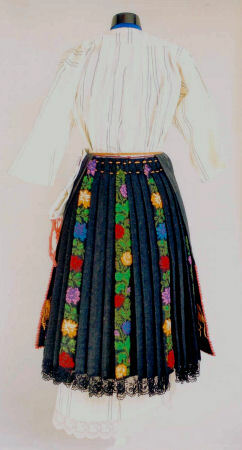 Here the back apron is short and wide, being pleated and gathered around the waist, and the front opening is covered by the apron. 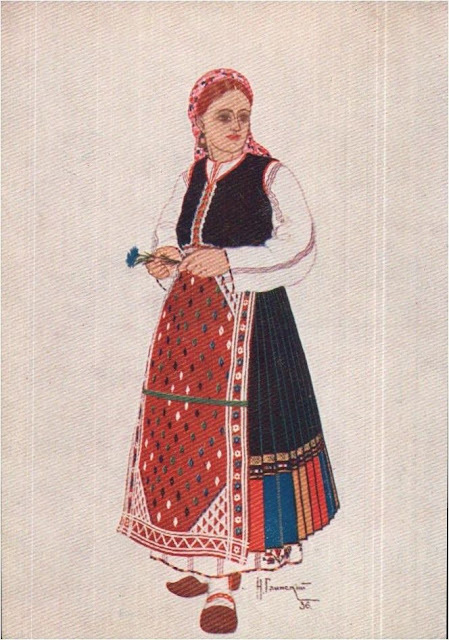 Novo Selo. Here the back apron is long and not very wide, leaving the chemise visible at the sides. 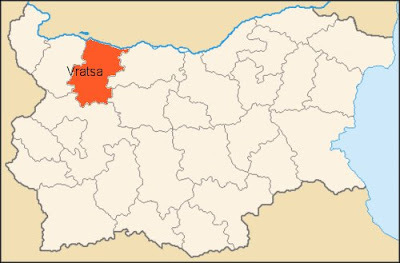 Kula village. 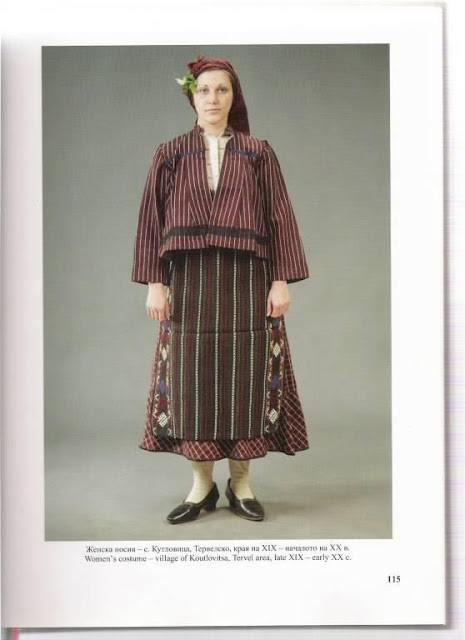 Again we see the pleated back apron. 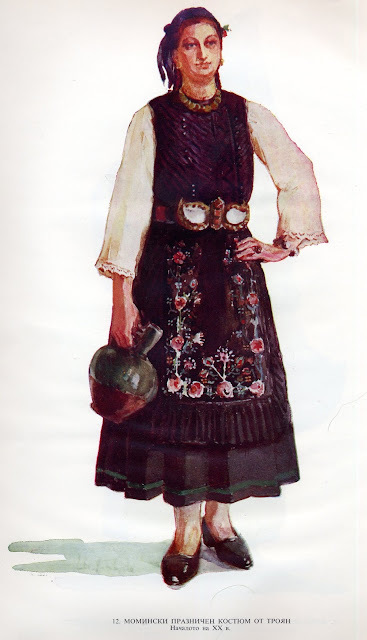 This girl is wearing a Serbian style vest. This village is close to the Serbian border. 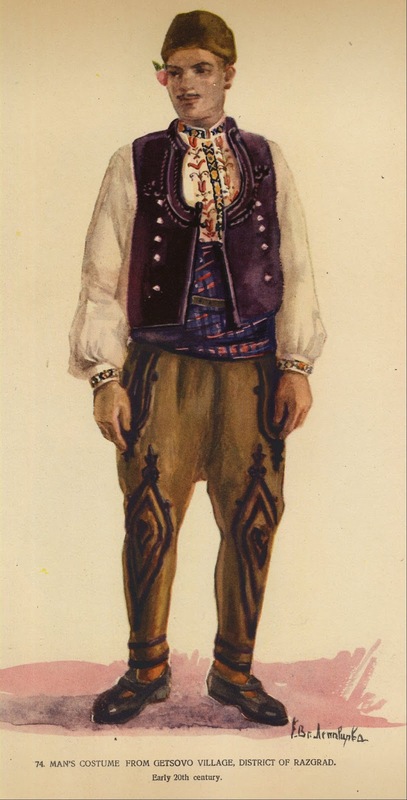 Some views of the men's costume. 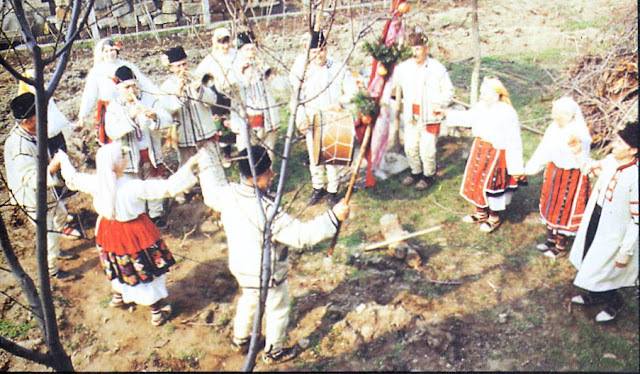 Here is a video of a group performing a village dance from this area. 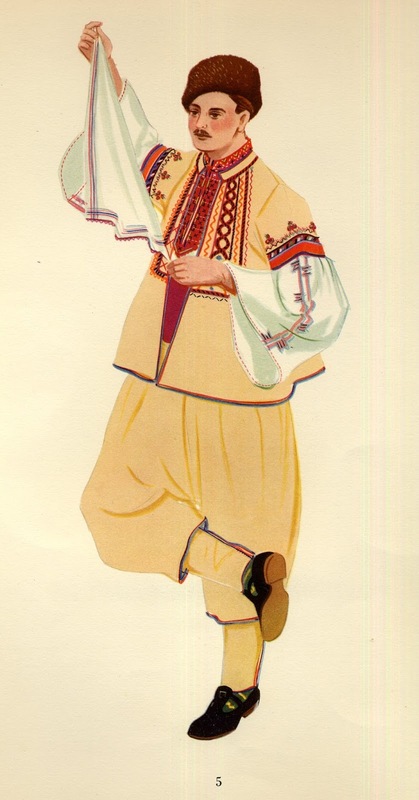 Here is a professional stage presentation of Vidin dance by the 'Severnyashki'. 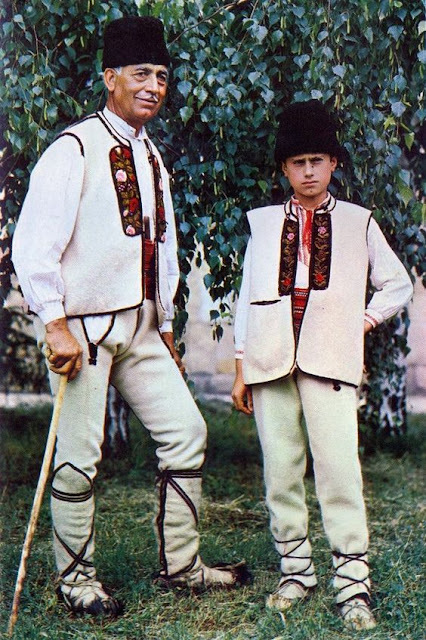 This is a video from a movie called 'This is Bulgaria'. This is the part which covers the northern or Danube region. 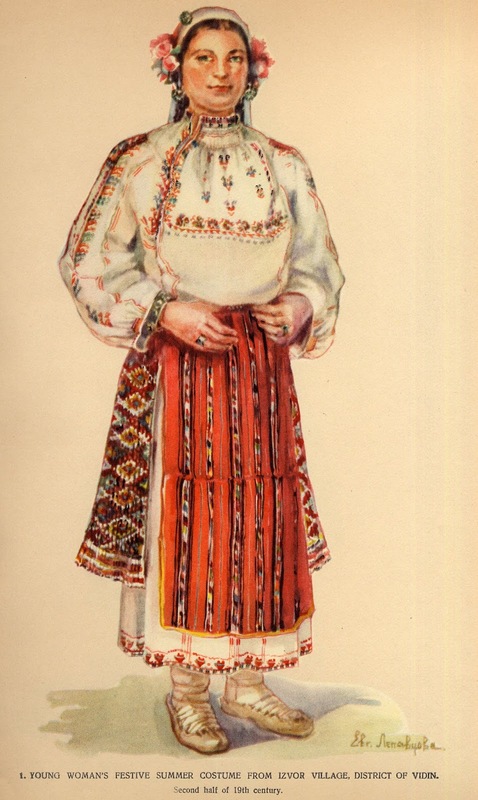 This is set in the north of Vidin oblast, among the ethnic minority known as Vlachs. 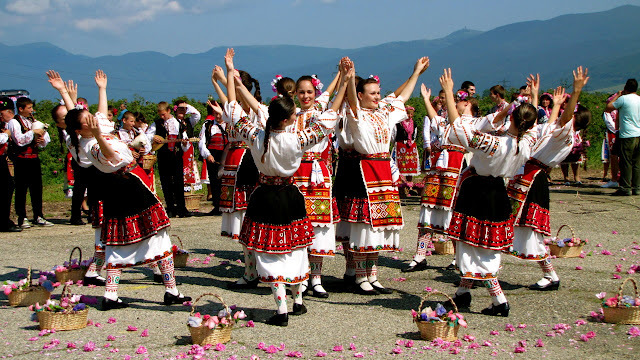 It starts by showing a folk healing/nature ritual dance called Kalushari. Then it shifts to midsummer night, with both men and women dancing. 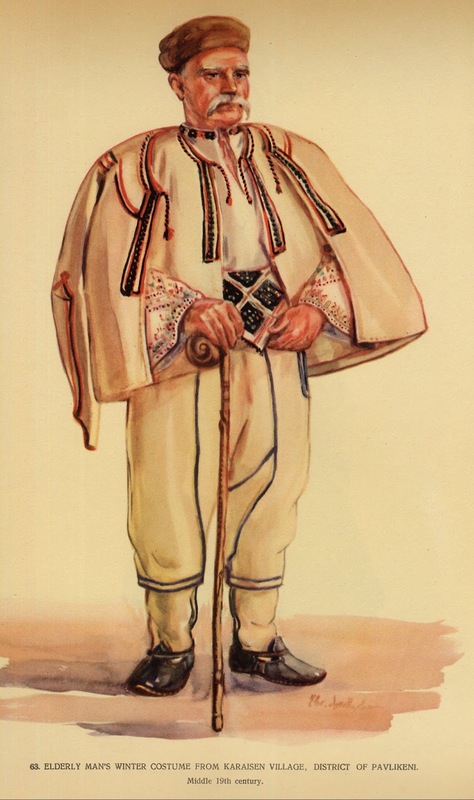 This man is from Mala Kutlovitsa village. 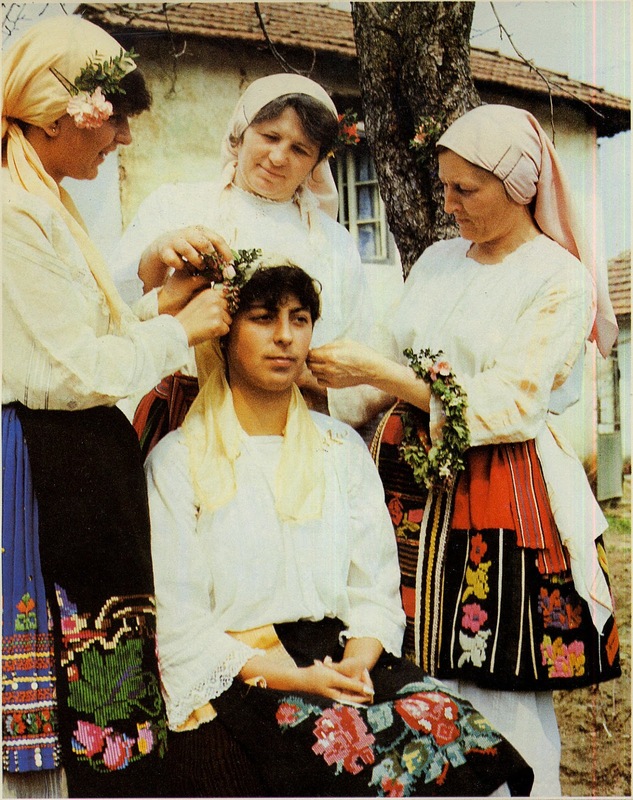 These photos are from a wedding in Borovtsi village. 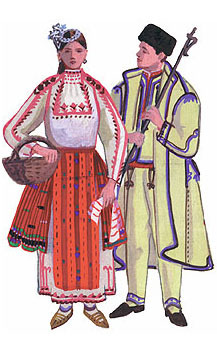 These costumes are from Yakimovo village. 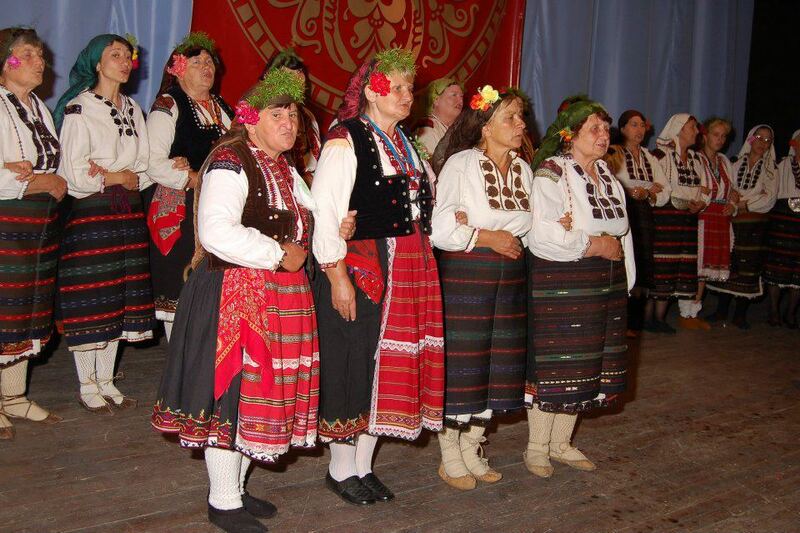 A local group doing dances from Vratsa. 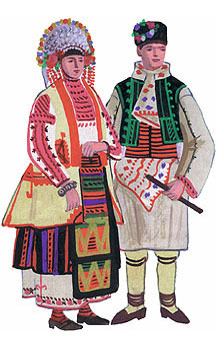 The costumes in this region are mostly of the two apron type, especially in the northern part. 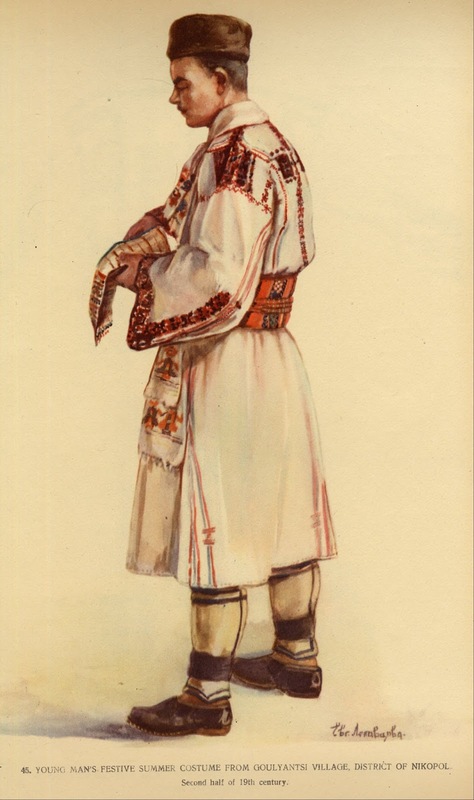 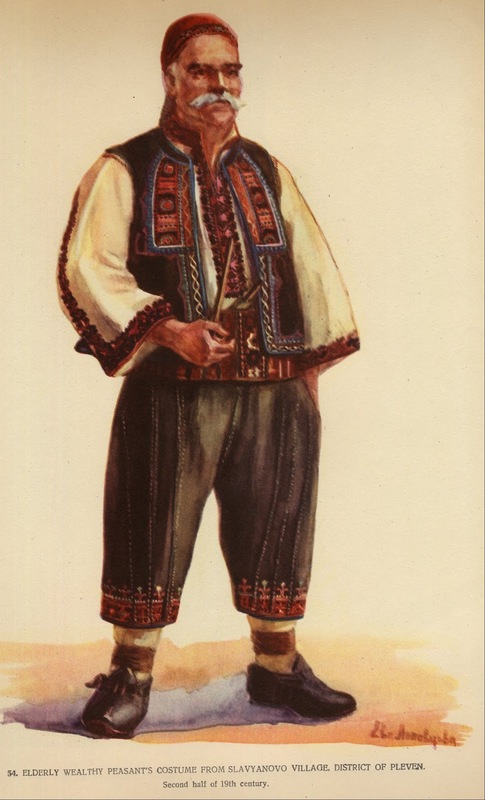 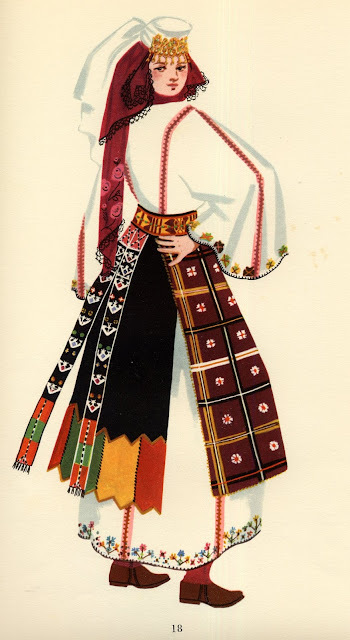 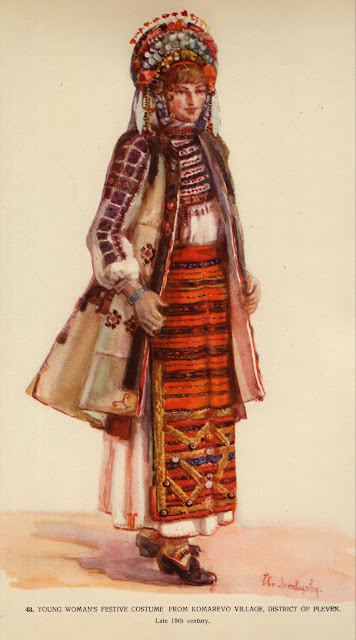 However, in the southern parts we see the Sukman [Soukman] costume which is typical of central Bulgaria, from east to west, as well as much of east Bulgaria. 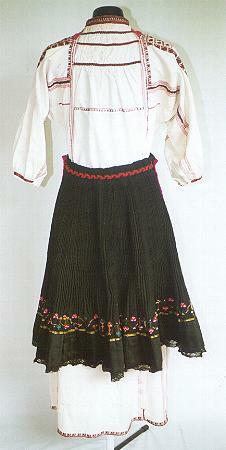 The Sukman is a sleeveless pullover jumper/dress which has no openings, usually in black wool. 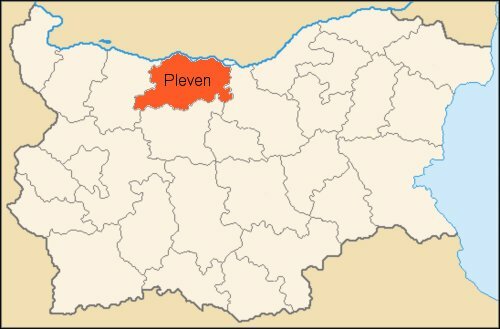 Here is a stage presentation of dances from Pleven. 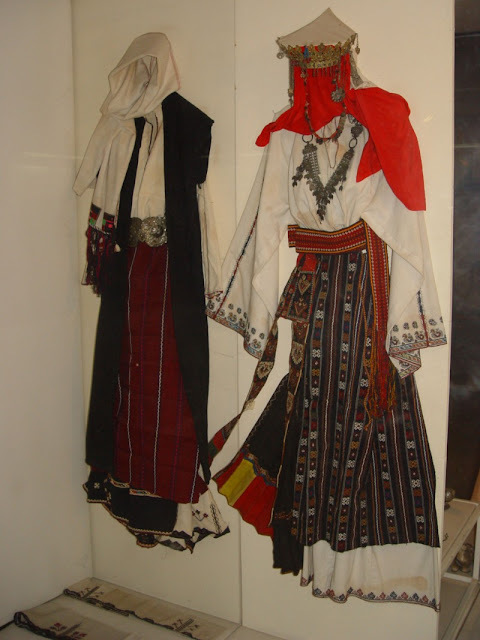 These examples of the Sukman costume are from the south of this oblast, around the town of Troyan. 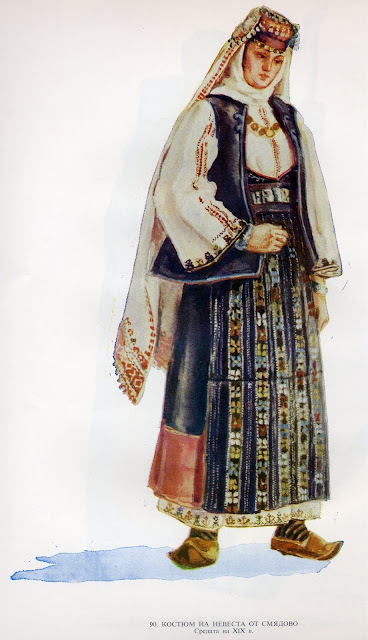 They look more typically Thracian. 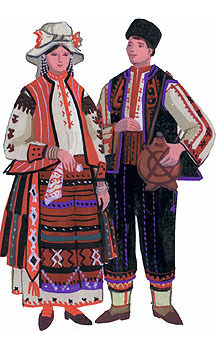 These double apron costumes are from around Sevlievo, in the north of the oblast. 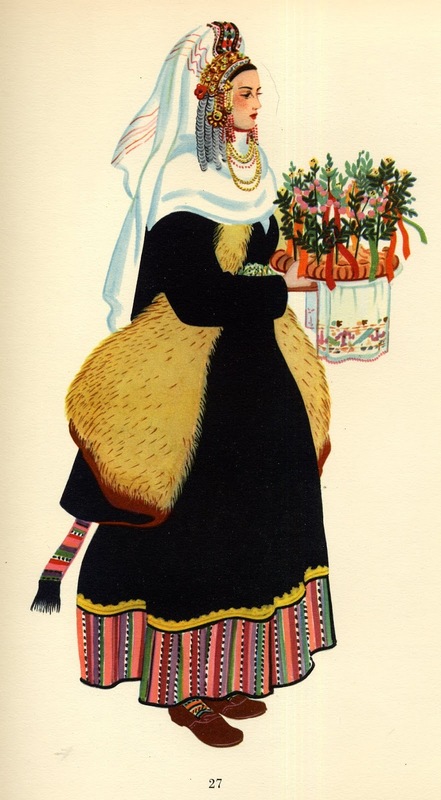 These Sukman costumes are from the village of Bozhentsi, near the town of Gabrovo. 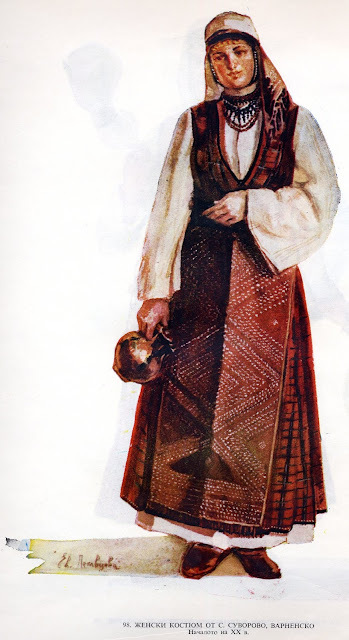 Again, this belongs to the Thracian type of costume. 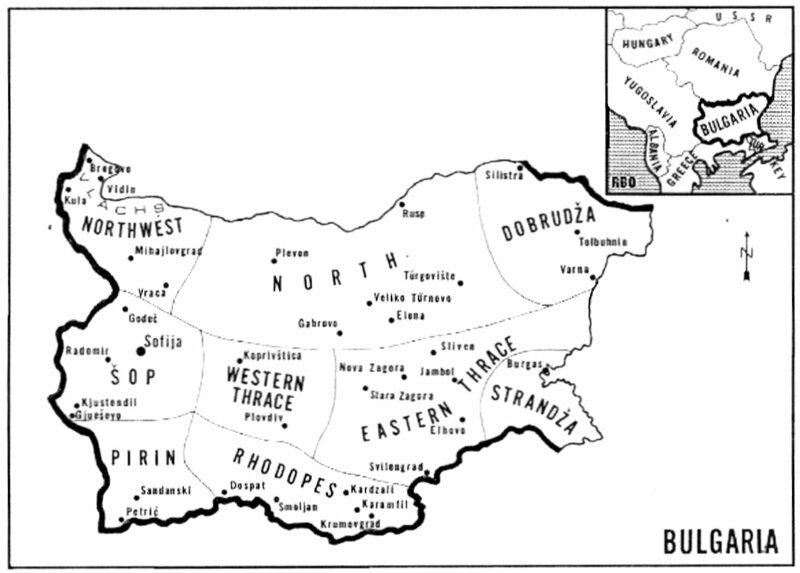 The northeast is a very transitional region, with the exact edges being unclear. This is complicated by the fact that the coast is very developed, with less folk costume being preserved than in some other regions. 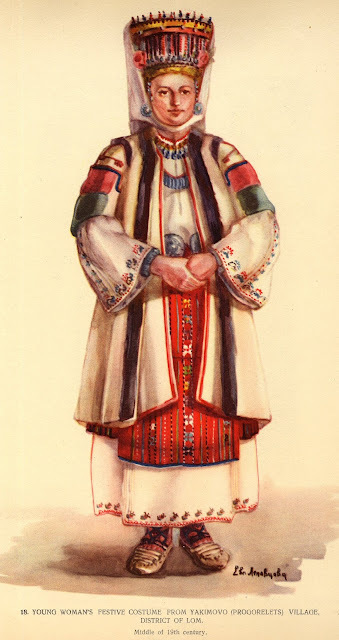 There are some typical features of the costumes of the northeast. 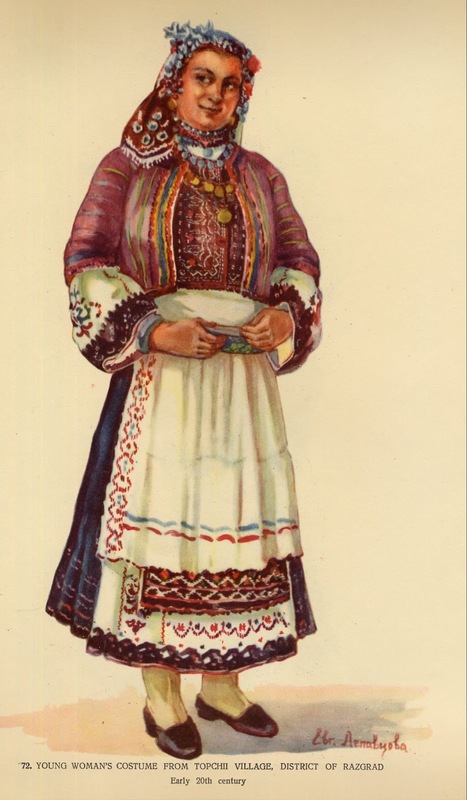 Women often wear vests or bodices, aprons are often highly ornamented and even embroidered. The two apron costume is found in a narrowing wedge as one approaches the coast, being replaced to both the north and the south by forms of the Sukman costume. 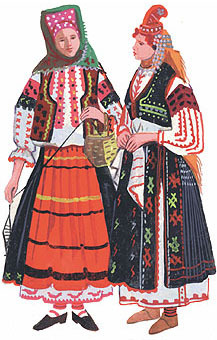 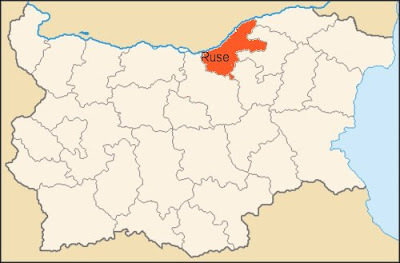 In this image, the woman on the left is from Ruse, the woman on the right is from Silistra, in Dobrudja. 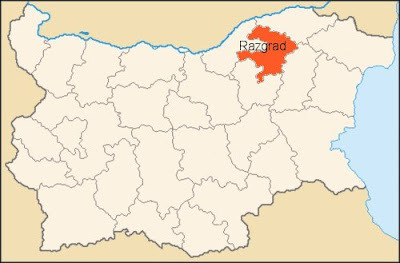 Razgrad is famous for being the home of a group of Bulgarians who are called Kapantsi. They were isolated for a long time and speak quite a divergent dialect. 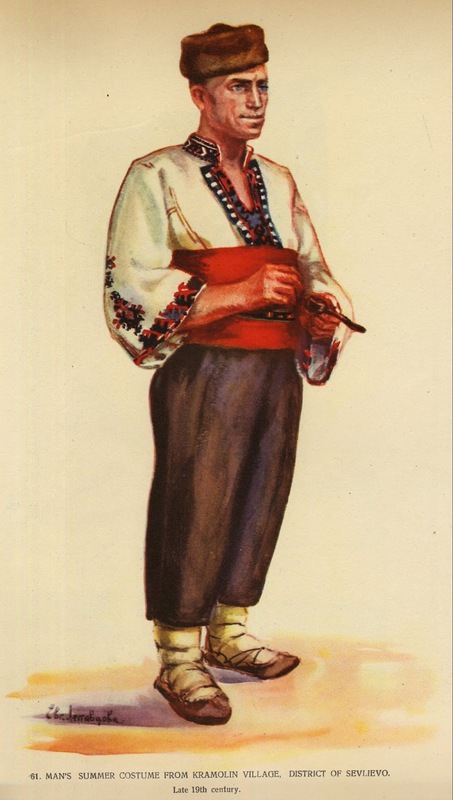 They also have many unique customs. 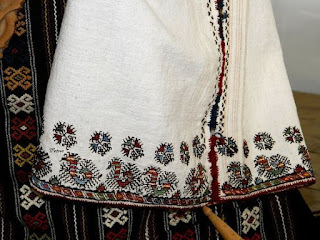 The costumes are known for the embroidery which is done with white thread on black linen aprons, as well as that which is more commonly done on the chemises. 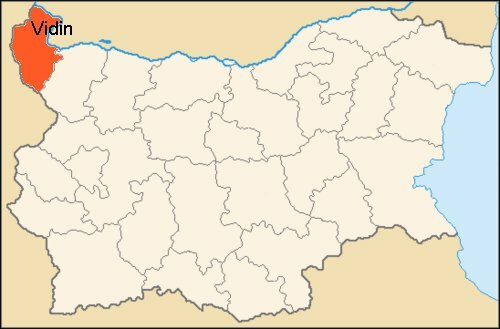 This area is part of a subregion called Ludogorie. 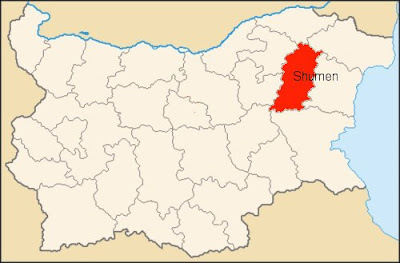 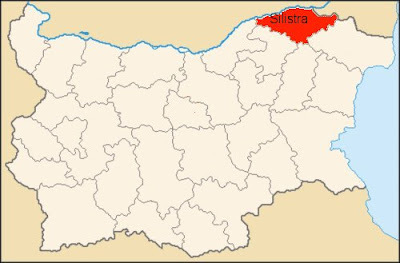 This consists of the oblasts of Silistra, Dobrich, and at least the northern parts of Shumen and Varna. 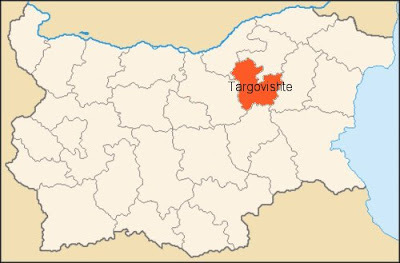 There are significant numbers of ethnic minorities in this area, in particular Turks, Gagauz and Tatars. 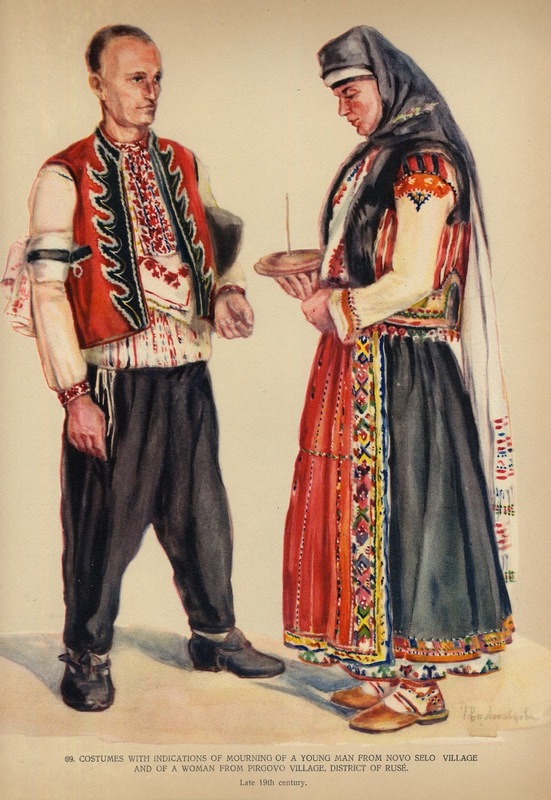 LIkewise there are significant minority populations of Bulgarians north of the border, in Romanian Dobrogea and even in Ukraine near the Danube. 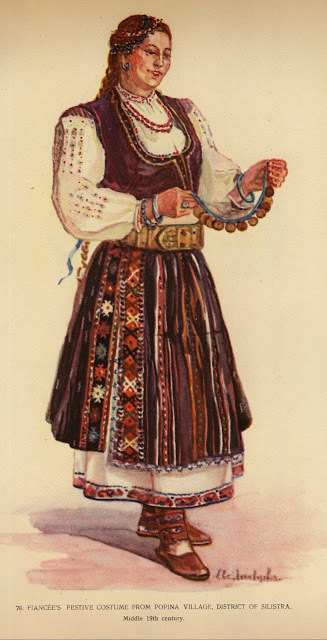 The music is slower and more lyrical in this region, and the dancing, especially of the men is heavier and very connected with the earth. A dance group from the town of Kalipetrovo near Silistra in Dobrudja. 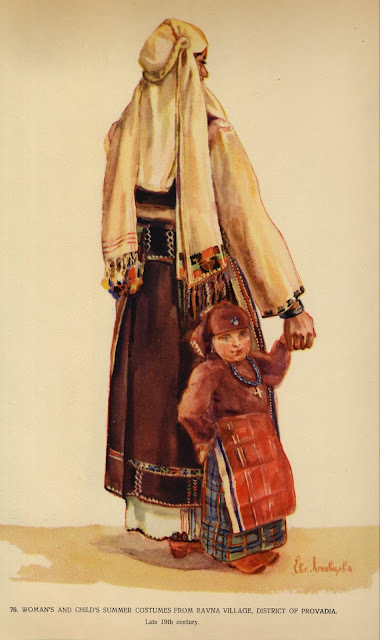 The women come in around the 5:30 mark. 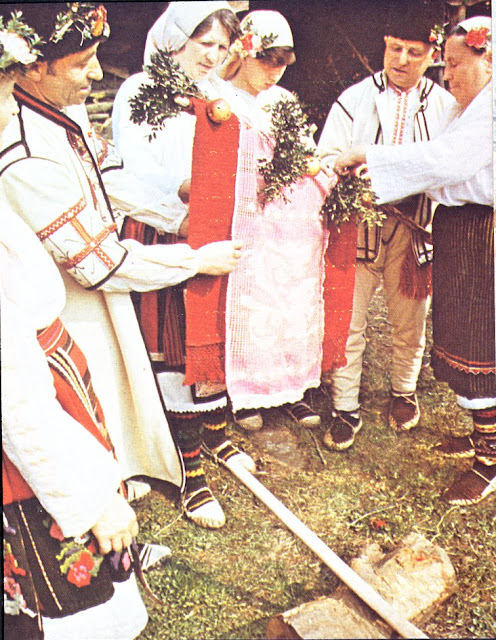 They finish with the men dancing on jugs. 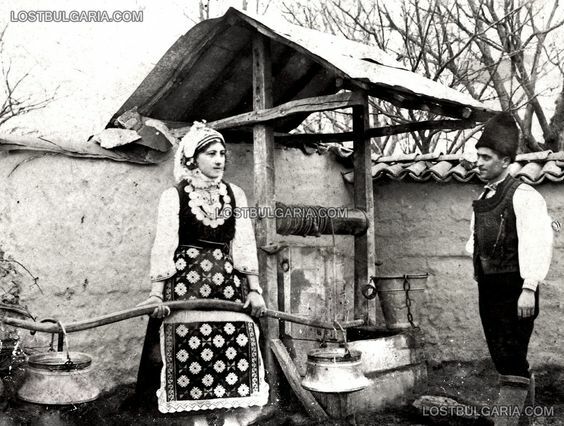 The following four images are from the area of Preslav. 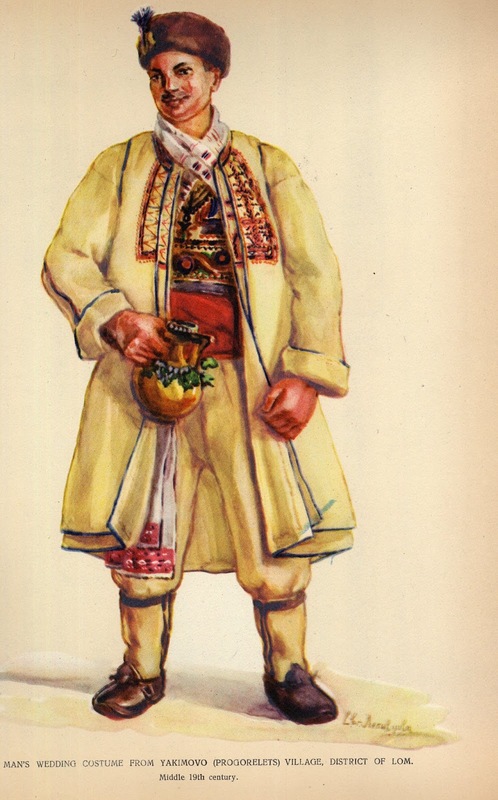 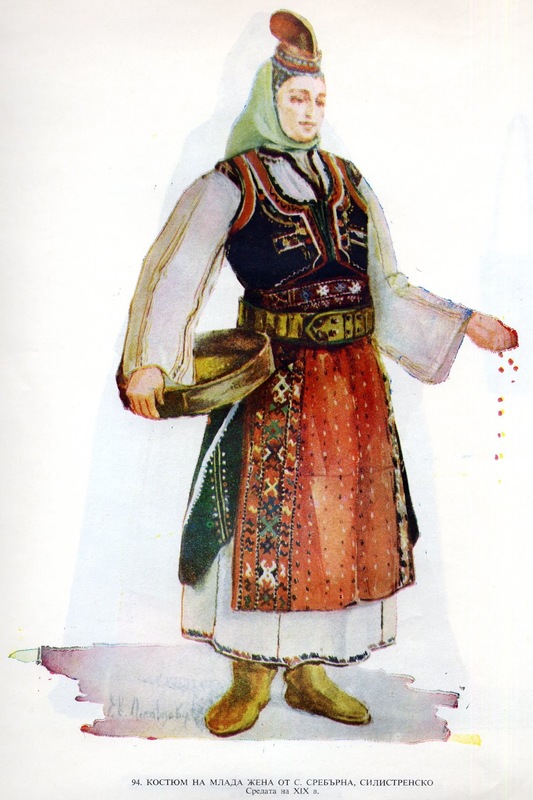 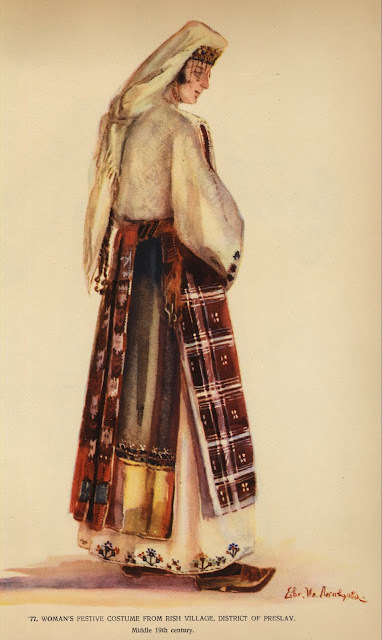 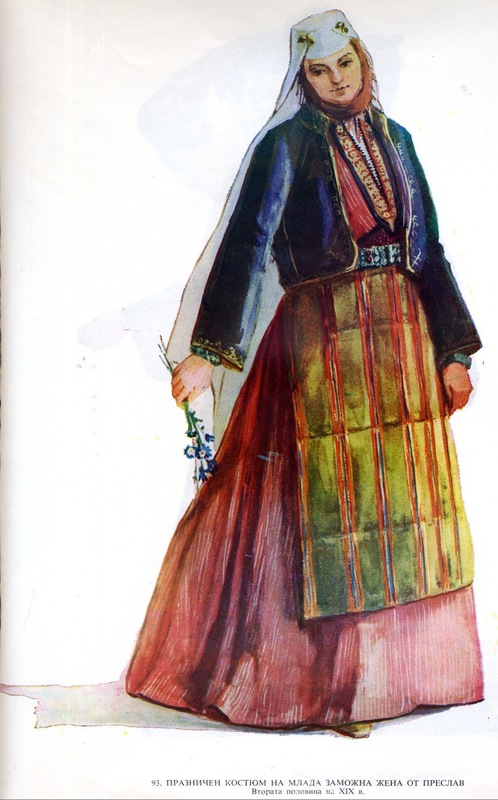 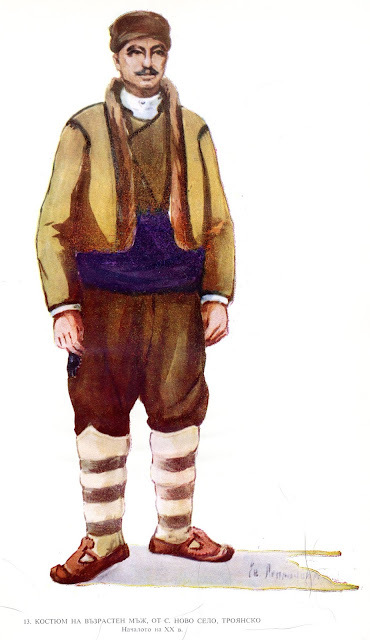 This is an example of town costume, rather than folk costume, heavily influenced by both Western and Turkish fashion. These two images are from the district of Smiadovo. 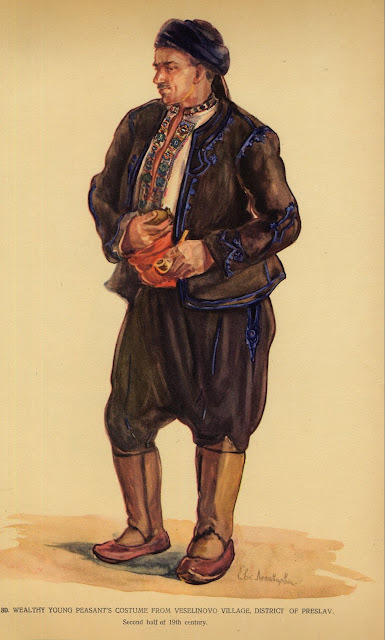 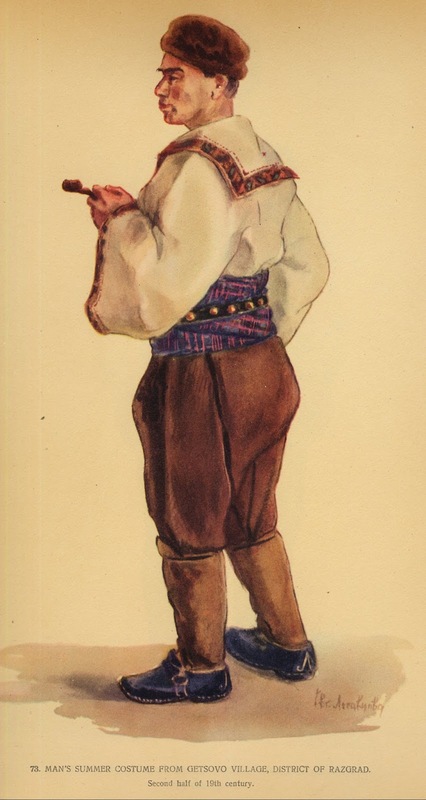 This oblast has both the double apron costume with a vest, and a variation of the Sukman costume, modified into a bodice with attatched skirt. 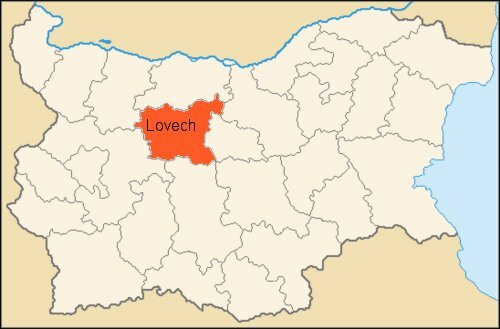 This is sometimes found in the eastern part of Bulgaria. 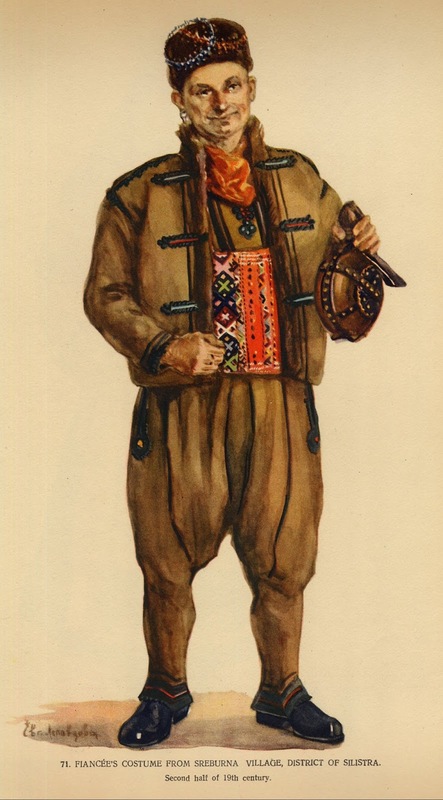 The men all wear the chernodreshda, or 'black' costume. 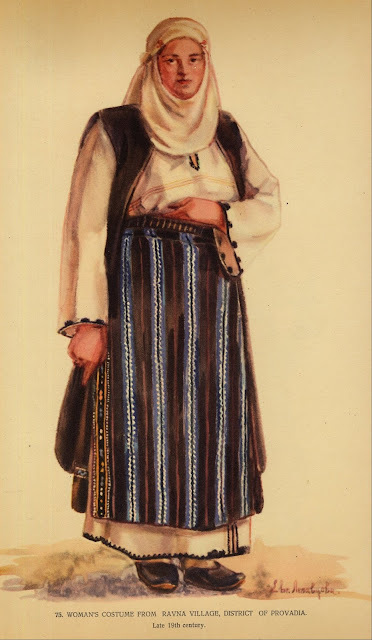 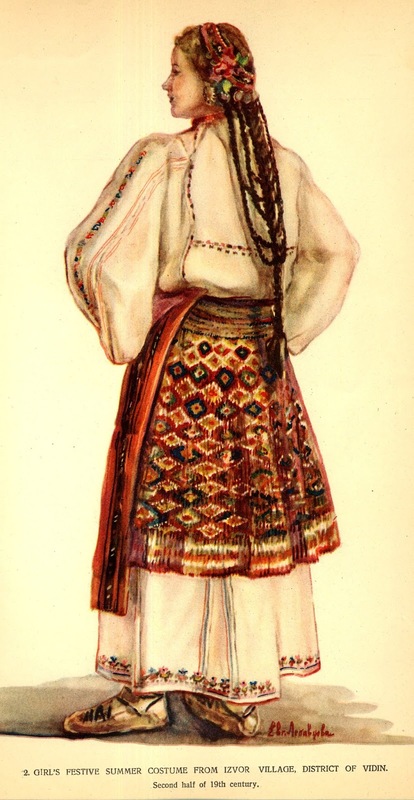 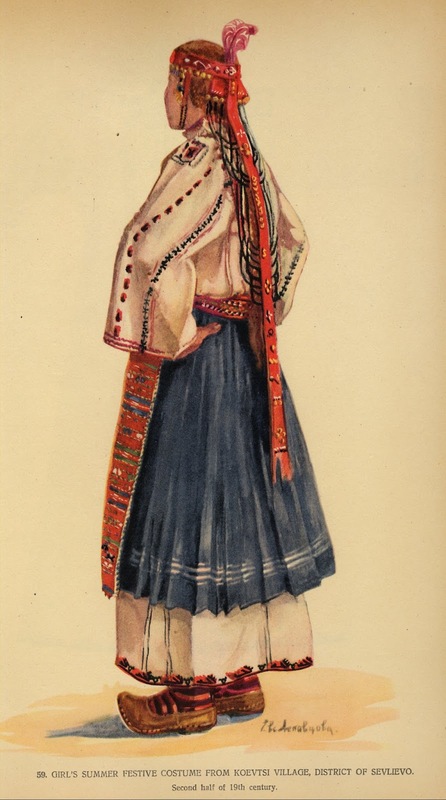 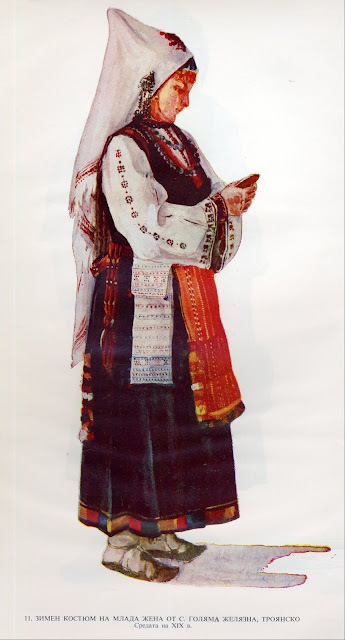 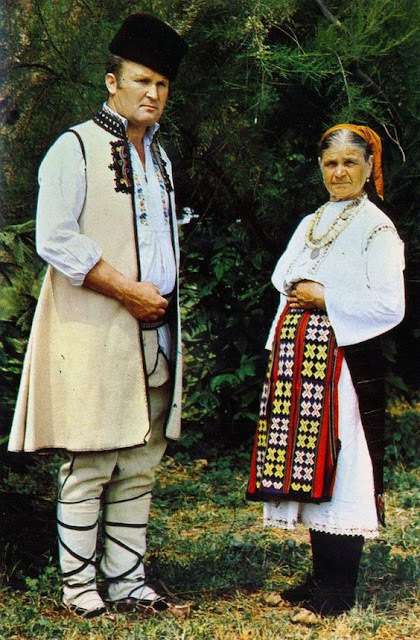 This is also in the heart of Dobrudja, and the standard Dobrudjan costume is worn here as well, sometimes with a separate bodice, sometimes with a jacket over that. The double apron costume is unknown here. 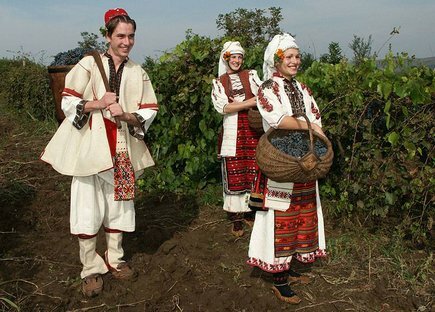 Here is a scene from the movie 'This is Bulgaria', which features vignettes from the seven cultural regions. 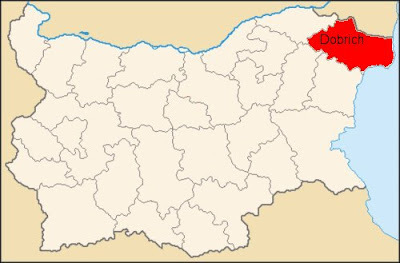 This is the part about Dobrudja, set in the town of Dobrich. Several artisan/shopkeepers decide to take a break and dance in the street. 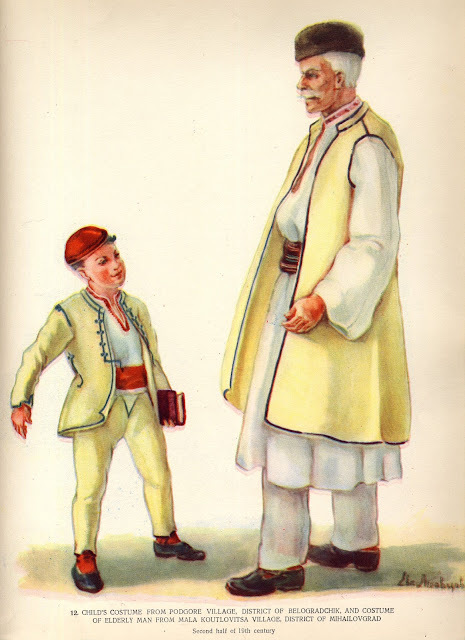 This devolves into a friendly rivalry between the woodcarver, the potter and the baker, each backed up by his respective apprentices. 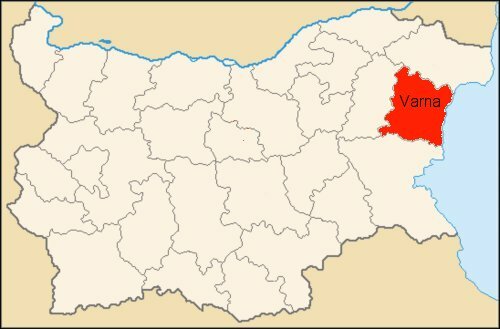 Varna is a large city on the coast. 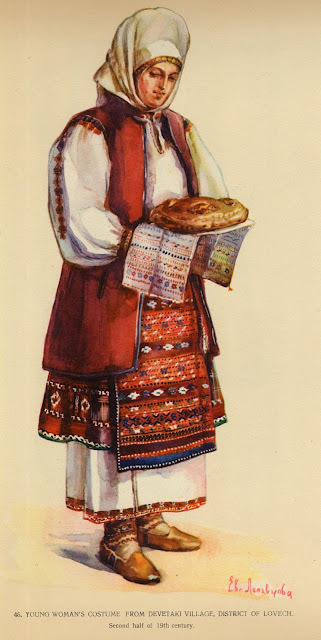 The north of this province is considered to be part of Dobrudja; in the west, there are some two apron costumes, as in Severnjashko. 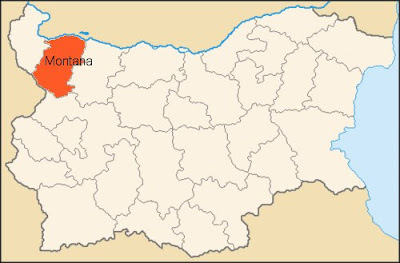 Some people consider this to be part of a distinct region together with Burgas oblast, called Strandzha. 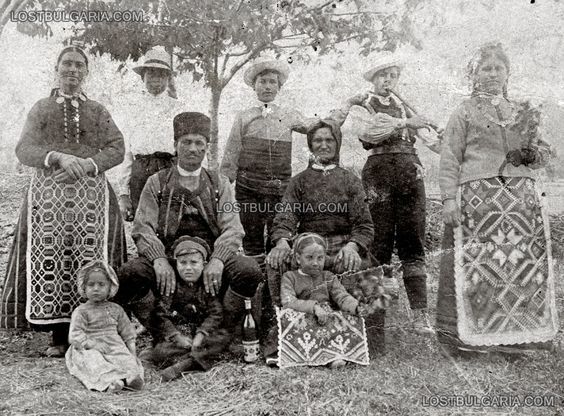 This is from the village of Chernevo, west of Varna. 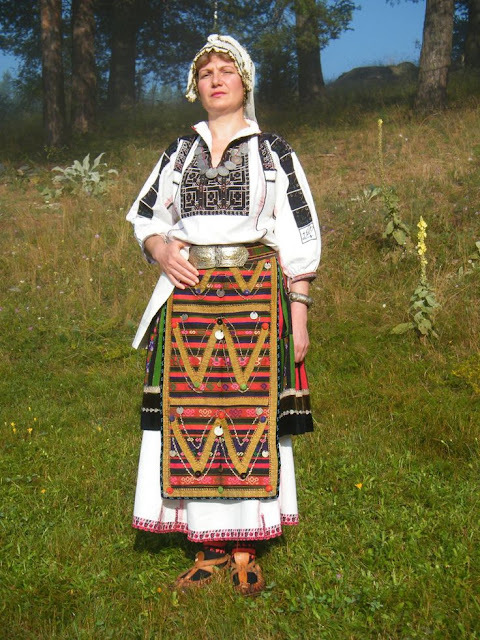 This is from the neighboring village of Suvorovo. 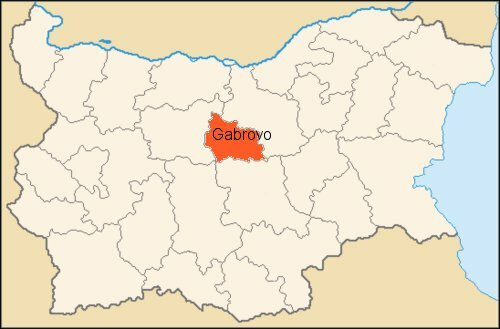 The following images are from around Provadia in the west of Varna oblast. A dance from Varna region. 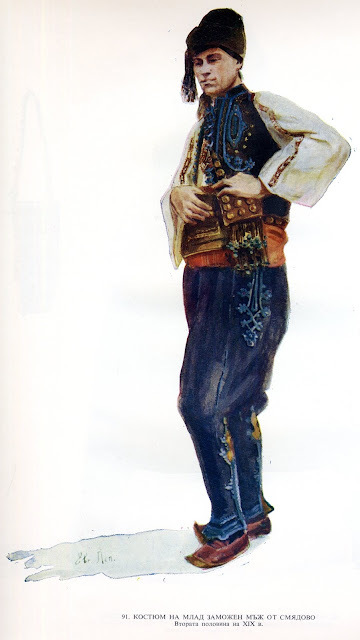 The musicians start by themselves and the dancers come in at about the 2:30 mark. Another video of dancers from Varna. I will continue to publish articles which cover all of Bulgaria.